This procedure is for patients who have been diagnosed with severe aortic valve stenosis and are considered very high or prohibitive risk for open heart surgery. This less invasive procedure is very different than open-heart surgery. TAVR uses a catheter to replace the heart valve instead of opening up the chest and completely removing the diseased valve. The valve used for TAVR is inserted within the diseased aortic valve. 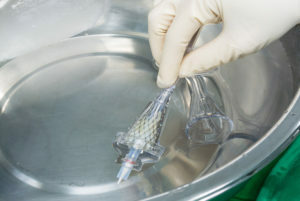 The new valve is crimped onto a balloon and is expanded pushing the leaflets of the disease valve aside. Thus a new aortic valve is implanted in the patient eliminating the need for open heart surgery. If you have been diagnosed with severe aortic valve stenosis and your physician feels that you are either a high or prohibitive risk for open heart surgery, TAVR may be an option for you. There are several factors your doctor and our TAVR team will take into consideration when deciding whether you are a possible candidate for TAVR. This includes your age, current health status, medical history, the condition of your heart as well as evidence of frailty. Our physicians may do a number of assessments to confirm that your aortic valve stenosis is severe. If symptoms or signs suggest severe aortic stenosis, our physicians may do a complete assessment to diagnose your condition and evaluate the severity of the aortic valve stenosis. Initially this is usually done by listening to your heart with a stethoscope as well as performing an echocardiogram (ultrasound of the heart). Subsequently cardiac catheterization is performed to carefully assess the aortic valve, coronary arteries and heart function. TAVR is only an option if you are either a high or prohibitive risk for open heart surgery. All potential patients will be assessed by a specially trained heart team, including two cardiothoracic surgeons and our interventional cardiologist. Together the specialized heart team will conduct a comprehensive evaluation to determine whether a TAVR procedure is an appropriate option for you.